A gracious and inviting 1808 Federal manor situated on a quiet country road just two miles from the village of Putney, VT. Listed on the National Register of Historic Places for its architectural merit, this lovely brick home will provide you with the perfect retreat and a relaxing atmosphere. 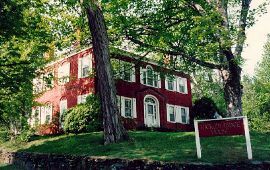 Hickory Ridge House Bed and Breakfast offers six beautiful guest rooms in the main house and two guest rooms, living room and kitchen in our adjacent cottage. Amenities include high ceilings, fireplaces, tv/vcr's, phones, and air conditioning. A full country breakfast is served each morning in our dining room or on the deck, weather permitting. The nearby village of Putney and the Town of Brattleboro offer a wide variety of shopping, art galleries, bookshops, and many fine restaurants. Rates range from $125.00 to $185.00 d/o and $18.00 for additional person. Visa, MC, cash, checks accepted. No smoking or pets allowed. Hickory Ridge House is located in Southern Vermont, just three miles from Interstate 91, and is easily accessed from Logan Airport in Boston, Bradley International Airport in Hartford, CT., and the Burlington Vt. airport. The nearest major cities are Boston and Hartford. This and other Putney Bed and Breakfast Inns can be found here in The Register.